When happy-go-lucky heiress Melsa Manton (Barbara Stanwyck) discovers a body in an abandoned house, it subsequently disappears leading the police and the press to criticize and dismiss her as a frivolous dimwit wasting the police’s time. She sues the reporter printing negative stories about her, Peter Ames (Henry Fonda), and sets off to prove that his criticism was unjust and inaccurate. She and her Park Avenue debutante friends determine to solve the mystery on their own, and soon a second body and the reappearance of the first body help convince the police and Ames that Melsa was right all along. Melsa and the debutantes and Ames and the police then race to solve the mystery. Although the role of Melsa seems to cry out for Carole Lombard, Stanwyck is not out of her element. She’s fresh and energetic, commanding attention at the center of the film. She projects such a capable persona that we believe Melsa can best the police and Ames at the investigation. She does her best to sell a movie that never comes together. The problems with the film come at the level of the script and the direction. Large pieces of the story are missing. The mystery makes little sense. Suspects show up out of nowhere, and their place in the plot is never explained. Melsa and Ames discover clues that would seem to have meaning, but the audience doesn’t know enough about the story to understand where they fit in. Clearly, the mystery is merely an excuse to have a movie, but the level of carelessness in developing the plot prevents the audience from engaging with the film. Stanwyck and Fonda have good chemistry, as proven by their later collaboration The Lady Eve. Yet, the romantic plot, like the mystery, is underdeveloped. Ames falls for Melsa without any build up. At one point he shows up completely enamored with her, and I had to rewind the movie to find out where that happened. Nevertheless, the two share a lovely romantic scene in Melsa’s darkened bedroom, which is beautifully photographed by Nicholas Musuraca. Some early dialogue sets up a class conflict between Melsa and Ames. He seems to have an animus for the rich who gallivant around while other people work and struggle. This idea of class warfare is immediately dropped save for a throwaway line or two later in the film about the middle class. Despite the problems with the script, the film might have succeeded if the direction had proven snappy enough. Director Leigh Jason never manages to get the rhythm or energy of screwball comedy, which, with strong performers, can hide the fact that the script doesn’t make sense. The scenes are flat, going through the motions of screwball comedy while never achieving the laughs. Unsurprisingly, Jason’s career, which peaked in the late 1930s and early 1940s, remained undistinguished. 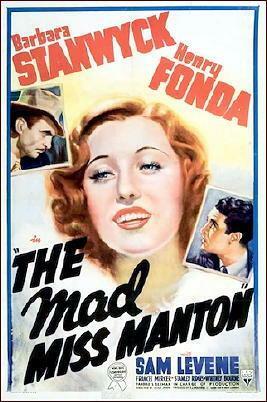 I wanted to like The Mad Miss Manton. It could have been better. It should have been better. Stanwyck completists, however, will find her performance commendable. And 1930s movie fans will enjoy the trappings of a classic movie, if not the execution. OSCAR-WINNER ALERT: Besides Henry Fonda, Hattie McDaniel shows up as Melsa’s faithful maid. I saw this film twice and the second time it was a bit better – but still silly nevertheless. What saves this one from being all bad is that chemistry of Stany and Mr Fonda- sighhhs! I also have to give credit to Nicholas Musuraca. That bedroom scene, or, rather, that scene in the bedroom is exquisite.